I'm pleased to announce a "Give a Gift, Get a Gift" promotion, just in time for the holiday season! Through December 31st, 2009, purchasers of gift certificates for a telepathic consultation with me will receive a complimentary flower essence from the renowned Green Hope Farm Animal Wellness Collection. Gift certificates for Animal Translations consultations are priced at $65. Purchasers will be able to select their own gift of one of the 22 flower essence blends from Green Hope Farm's Animal Wellness Collection, each of which supports an animal's emotional, physical, mental and spiritual well-being in specific ways. These custom-designed flower essence formulas are alcohol-free and are safe for all animal species. 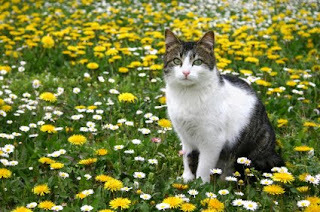 They include blends for Abandonment and Abuse, Animal Emergency Care, Anxiety, Breathing, Caretakers, Digestive Woes, Pests ("Flee Free"), Urinary Tract Health ("Flow Free"), Grief & Loss, Healthy Coat, Immune Support, Jealousy, Neediness, New Beginnings, Outbursts, Recovery, Running & Playing, Senior Citizens, Separation, Showcats, Spraying, and Transitions. Each comes in a 1/2 ounce blue cobalt bottle containing more than 300 drops. Animal Translations gift certificates can be purchased through the "Consultations" section of the website.